Ok, apologies for not updating sooner, so I'll try to get in the last three days in this update. On Wednesday, we went to Atlanta to take part in a "Life Experience" activity. The first part was basically a scavenger hunt that had us running around the Atlanta airport. It was a lot of fun, even though it was a little uncomfortable at first. I got to have a few really good conversations, including one with a former pharmaceutical rep who got hooked on prescription drugs and alcohol. During the course of the conversation, she asked, "Don't you think you have to be completely broken before God can really heal you?" I responded, yes, and shared a bit of my testimony. 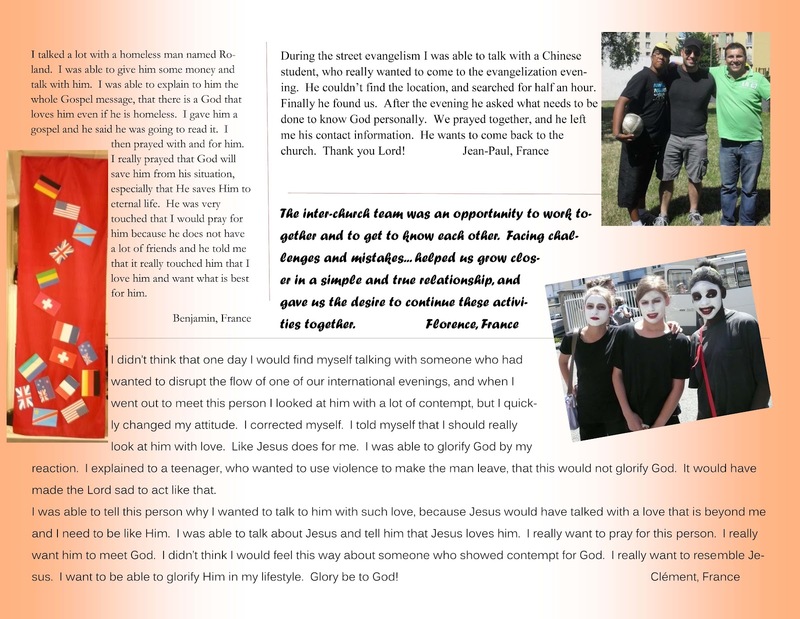 It was really awesome to be able to connect in such a God-ordained way. 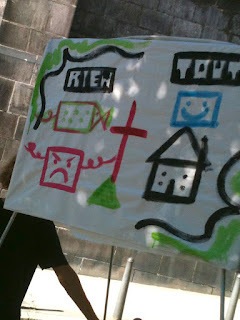 The second part of that activity was to go in our "tribes" and pray or serve someone that we saw around Centennial Park. We got to do a prayer walk through the CNN World Headquarters, pray for a homeless man on the street named Larry, and pray for Christie, the VP of a non-profit that works with young people in the Atlanta area who was setting up for an outdoor conference. Harmony House. We stayed in the apartment on the left. Every Thursday, the OM USA office gathers for a time of worship and prayer for the countries around the world. When we walked into the room, there was a large map on the floor. People were able to stand on the country that they were serving in or that they had a burden for. It was amazing to hear from so many missionaries who are serving around the world. There is a strong focus on the Middle East and North Africa right now, so we were able to pray for our brothers and sisters in that region of the world. Please pray with us that the church will be strengthened in the midst of very oppressive situations. Some members of our tribe, Emily, Olga, Patrice, Michelle and me. We spent these last few days making some really great friends, and developing life-long partners. Tonight, we shared communion together and then prayed in our tribes, commissioning each other to carry the gospel to the country God has called us. It was a really beautiful time of worship and prayer together. 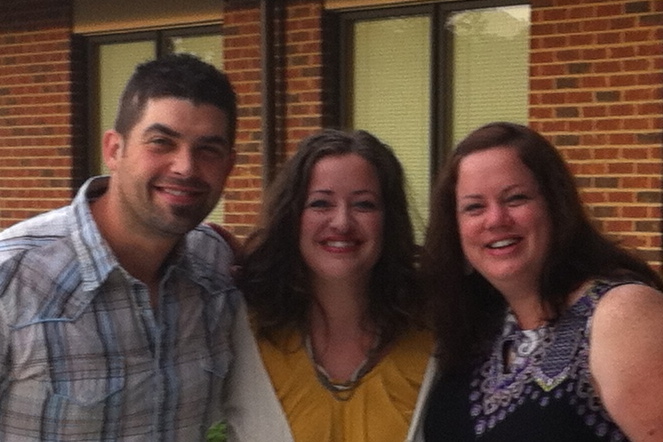 Michelle and I are coming away from this conference convinced more strongly than ever that God's call is on our lives. We can't wait to get back home and begin to share what God is doing. Thank you so much for your prayers over this week. Please pray for us as we travel back home tomorrow. Even as I write "day 2," I find it hard to believe. It feels like we've been here a week already. We have had so many meetings, training sessions, and one-on-one discussions, it feels like our brains are about to burst! Today we covered a variety of topics, beginning with prayer for the region of MENA (Middle East & North Africa). We heard stories about how God is working among Muslims in the region, and it was both exciting and heart-breaking at the same time. God is doing a powerful work. Did you know that the church in Iran is the fastest, and largest-growing church in the Muslim world? I didn't either! God is doing an amazing work there, but the need is still so vast. Please keep praying that the truth of the gospel will penetrate the hearts of those in that area of the world. We also talked a lot about transition; both to the field and returning home. It was really a good discussion/session. We were able to talk to several individuals who have already been on the field about how to best prepare our kids for this transition. Good stuff. We ended the day a little earlier than the last two nights, so it gave us some time to answer some emails, and read a bit before the end of the day. I am more convinced that God is doing something throughout the world right now, and in this time. I am more stirred to pray for the lost and for workers who are making disciples than ever before. This is our room during the conference. That bed that Michelle is sitting on has been the bed that we're sharing during the conference. It is ok, we love each other, we don't mind being close. I would like to end with this question: How are you answering the call to the Great Commission in your life? Inside the central OM USA office. There are 6100 missionaries worldwide representing about 118 countries. We traveled on the road for about 15.5 hours yesterday, leaving our house around 6 am and pulling into the OM property at about 9:30 pm. It was a long day, but Michelle and I really got a great opportunity to talk together and dream together. Since the kiddos are with Michelle's family this week (Thank you Mike, Donna, Meredith, and Nathan! ), we actually had quiet time to process through all that God has done and is doing in this missionary process. If this is all new to you, let me just explain a little about what is going on. Michelle and I are participating in a job interview/orientation/training conference with Operation Mobilization (OM) called OutBound. These conferences take place about twice a year. We were invited to be a part of this week because we have applied for their long-term missionary program. We have been praying about going back to Europe, and we really feel like this is the next step for us. So far we've had to fill out loads and loads of online forms and paperwork, take personality tests, get references, get physicals, and do phone and face to face interviews. This week is another part of the "getting to know you" process. We are exploring OM and they are doing the same with us to see if we would be a good match together. Without a doubt in our minds, God has lead us to this place, and we are simply taking the next step. We are still praying about where to go exactly (even though we have some idea in our minds), and we're praying about how we will integrate the kids into their roles on the mission field. Today we had about a 2-hour interview with the Member Support team. They asked all sorts of questions from, "How do you fight?" to "How do you make decisions?" and "What is your greatest fear about this process?" Michelle and I both walked away feeling really good about their approach, and about how we will move ahead with OM. After this conference is over, they will get the sending committee together to review all of the interviews, applications, and notes from the week and come to a decision on whether or not they want to invite us to be part of the team. So even though we are a few weeks away from knowing what will happen, we feel more and more confident that this is right. We can't thank you enough for your prayers and financial support that you've already given to us. We literally couldn't be here without it. Please just continue to pray that God makes things very clear to us and to OM this week on how to move ahead. Feel free to check out the OM website for more info on their organization at www.om.org. This is the outreach report from our missions trip to Clermont-Ferrand, France. These pictures and quotes are from the team, including us! Many people have asked me, "How was France?" or, "How was your trip?" I don't know how to answer that question in a word, but if I had to sum it up, my answer would be, "life changing." I know that God is doing a new work in my heart and in Michelle's, and I know that he opened a wide door for us to even get to France to begin with. I think it is evident that there is something here for us to pursue. The issue, though, is that I don't know what that looks like in the meantime, or if it is even supposed to be a full-time thing. What do we do while we wait? In the past, I would have felt paralyzed at this stage. Impotent and impatient. But I really think that God is. challenging us to do something. We have an opportunity now to invest in relationships and build the kingdom here, in Garland, Texas. I don't want to waste any time or opportunities to love others, to pray, to prepare, to do something for God. While we wait with quiet and secure faith in God's timing, we will also eagerly expect what is to come. I feel alive in a way that I haven't felt in a long time, and I want to "fan into flame the gift" that God has given me. For everyone who reads this, I'd like to ask forgiveness for holding back from you in the past. I was trying to "save up" my passion for the "real" work God called us to. I was selfish to withhold my love, commitment and brotherhood from you. I would like to try to change that. I want to be open and available. I want to love and live passionately, and I want to do it alongside my brothers and sisters. I am so thankful for all of the people that He has placed in my life. I am humbled by your love. So, that being said, do you want to change the world together. Let's do it. Let's pray together, trust in God together that he can change our lives, our families, and our communities. Let's not waste time, let's not be isolated and fearful in giving our hearts and lives for one another. I love you, and I want to do something with you! Our prayer team before going out on the streets. Yesterday was our final day of outreach to the city of Clermont-Ferrand. Overall it was a really powerful day. Since it was a Saturday, we had quite a lot of extra help from people in the community. We began the day with prayer, asking God to make our efforts effective for Him. It was so great to see so many people gathered to pray. Just before the flash mob on the city square. This particular day's focus was on one of the main squares in Clermont. We set up a large flash-mob, did mime, testimonies, and Sketchboard presentations. The many faces of Timothy after jumping in a fountain at the central park in Clermont-Ferrand. The response seemed to be very good. We also passed out invitations to a BBQ that the church hosted that evening. Emily and Nathanja passing out invites to the soiree. 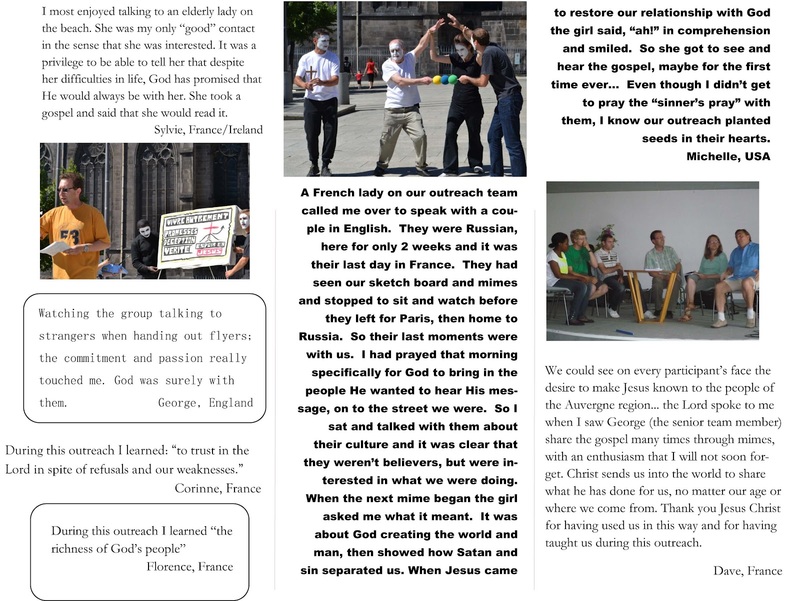 We moved locations several times in order to present the gospel to more people, and the last location was in front of the Clermont-Ferrand Cathedral. It was so good to be part of shining God's light in such a spiritually dark place. This was evident because a local shop owner threatened to call the police if we didn't leave. She put up signs in her store windows warning other people about us! This included an all-you-could-eat BBQ, songs, traditional Irish dancing, skits, etc... We had a very positive turnout from the community, and had a chance to share the gospel with many for the first time. View of the courtyard from our balcony during the BBQ. Today was a final celebration service. All of the local churches gathered together at Les Eaux Vive (the host church during the outreach), and we all worshiped together. It was really amazing to see the unity of the local churches. 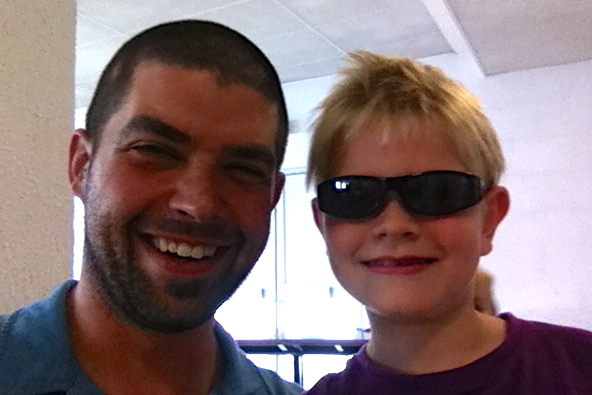 Me and my buddy Sam! The pastor of the church, Jean, preached on using our gifts and talents for God. Each person is unique with different skills and abilities, but all of us have to be willing to let Him use us for His purposes. The Spirit of God was so strong in the room. After the service, we all ate a final meal together, and began saying our “goodbyes” to one another. There were a lot of bittersweet tears, hugs, and prayers for one another. It was hard to believe that we had only known each other a week. connected with Emily and Daniel! This afternoon a host family invited our kids to a local waterpark with some splash pools and inflatable rides. We had a little trouble when we got there, because Daniel and Timothy’s swimming suits were not considered proper “swimming costumes” and they would not let them into the splash pool. Fortunately for them, our host family knew someone nearby with two boys near Daniel and Timothy’s ages and size, and they got to borrow their swim trunks. I really wanted to get a picture of the boys in their French swimwear, but they were already in the water, and I didn’t want to be the creepy guy taking photos of kids in a pool. We then went to the Michelin tire plant where we saw the world’s largest tire. Afterwards, we had a lovely outdoor dinner with our host family in their backyard. Tomorrow morning, we board a train to head back to Paris for one last night before our flight to the states. Thanks so much for your prayers for us this week. God is really moving in our family, and I can’t wait to tell you what He is doing in our hearts over a cup of coffee, or a 3-course meal! at our host family's home. "Le Flash Mob" during an afternoon outreach session. We are nearing the end of our time in Clermont-Ferrand, but today was one of our most productive ministry days here. As I may have said earlier, we were able to share our testimony on Tuesday morning. Many members of the team have since come up to us to tell us how much it meant to them. 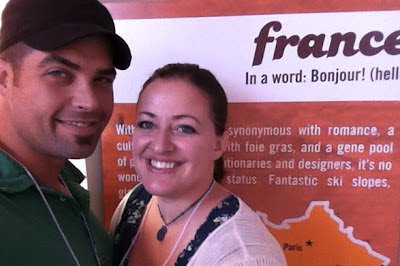 We are just both so excited to talk about what God has done in our lives to bring us to France. Michelle and I both had opportunities again today to share our story. Michelle got the chance to share her story during on of our afternoon outreaches. While she was doing a Sketchboard presentation, she met a couple from Russia that happened to be traveling through the city that day on their way to Paris. She was able to share the love of God with them and offer them hope, in both a literal and metaphorical way. She happened to have one of her pieces of artwork with her, a round, wooden disc, with the word "Hope" painted on it, and gave it to the the woman. I know that this was more than just a chance encounter! In the courtyard of our "base" church in Clermont-Ferrand, Eaux Vive. Tonight's international service was in a church in Clermont-Ferrand, just west of church where we have been gathering each day. Daniel and Timothy both got to participate, Timothy by introducing Daniel, and by Daniel doing his Napoleon Dynamite dance (which has had a great response every International night so far!). They also sang with some of the other kids in French and did the hand motions! One of the best part of the trip so far has been the international nights. 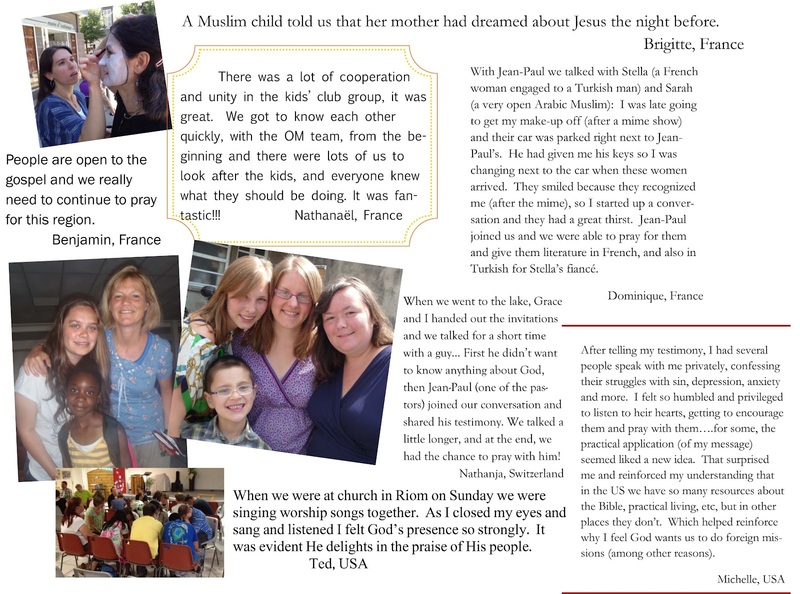 It has been so good to see how God is working in the different cultures around the world. Tonight was special for me because I was asks to share my story about how God brought me out of sexual addiction and totally redeemed me. I have felt God give me the courage to be honest about my past, and I feel that He is using something so destructive to help the church in France. Many men - pastors of the churches here especially - have told me that this is a secret struggle that many men are dealing with, and that it is good to bring it out into the open. I am just so thankful that I get to be part of God's process of healing for other men. It is so humbling. he doesn't have the money to buy a sign. 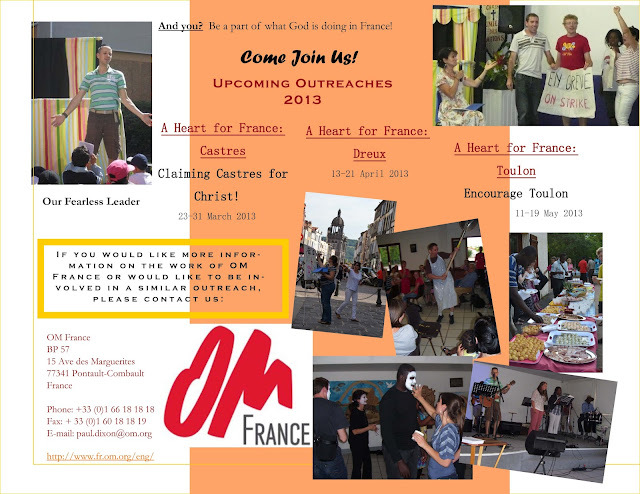 God is definitely doing something here in Clermont-Ferrand, and he is doing something in our hearts. I have really felt the love of God for the French people in a way I never felt before I came here. God is certainly stirring my heart and Michelle's and we're both very excited to see what the next step is going to be. We have one more day of outreach ministry here in Clermont. Please be praying that everything will go smoothly, and that the seeds of the gospel will be planted in the hearts of those who will see and hear the presentations tomorrow. The last week has been a blur of activity! We meet together daily for devotionals, worship, prayer, testimonials, meals, and the outreaches. So far we have done outreaches in 3 different towns and have visited 3 different participating churches. There are only 8 evangelistic churches in this region, which is strange coming from Dallas, where there seem to be ten on each major street. Yesterday we climbed one of the highest dormant volcanoes in the area. A local man told us there are around 80 volcanoes and craters of different sizes, and many of the buildings are made out of the volcanic rock. From the top of the mountain, the view was breathtaking! There are also ruins of a Roman temple built to worship Mercury, built in the 1st century AD. of mountains in the background. The ruins of the temple of Mercury at the top of the Puy de Dôme. Timothy, Ted, and Daniel at the top of the mountain. 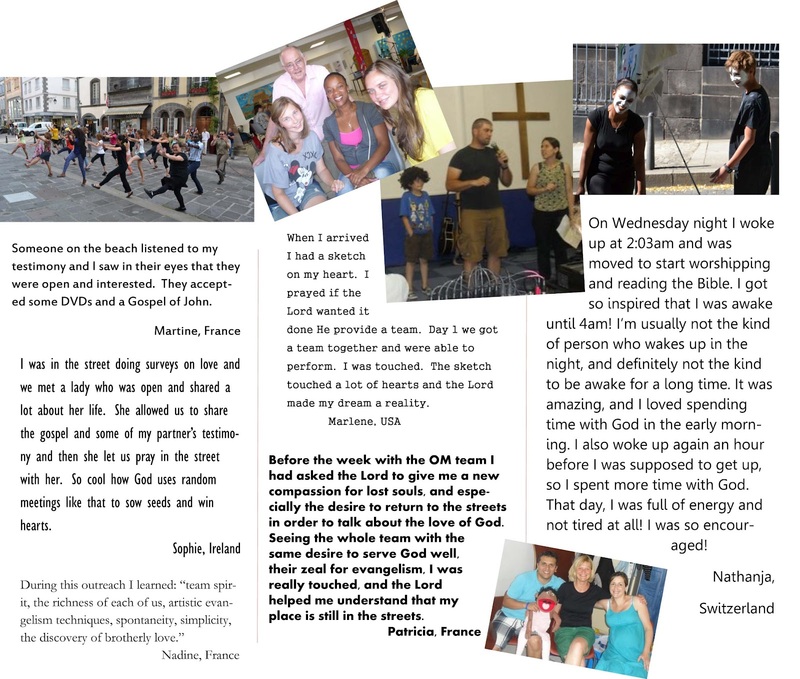 Tonight was our 2nd international service, which has been so much fun! Team members from France performed a skit about how they're always on strike, we learned a song in Swiss-German, a traditional Scottish dance (so much fun! ), watched an African drum line perform, and listened to some French gypsies sing. The Americans performed a skit featuring Timmy as a host and Daniel doing his Napoleon Dynamite dance. It's been wonderful to learn more about the other cultures, have great conversations, and do ministry together. Not to mention the food- several courses of homemade French cuisine that takes 2 hours to eat and several more to digest!Ted and I were also asked to share our testimony, and we've had a tremendous response. So many people have told us that it blessed them, and then we've had the opportunity to encourage them as they share their struggles with us. I thought it would be best to take today to show a video interview we did with the kids this evening. Today was "officially" our day off, which meant that we did laundry and toured the Puy de Dôme (a dormant volcano) before turning in an hour earlier than normal. Tomorrow is more outreach, and another International Night service, that Michelle will talk about more in tomorrow's post. So it is now after 1:30am, and I still haven't taken a shower. That said, we'll post about today's events tomorrow. I'm just too tired to go through the effort of putting up more photos, and I want to get the kids involved in the update process as well. Just know that we are safe, but sleepy! Today was the real thing! We began the day with some worship songs, and small group devos. The worship time was fun because like so many missions trips, everyone is included and there is almost no practice time. We all got about 2 minutes practice time before the group worship time, and there were 3 guitars, a bass, a trombone, keyboard, clarinet, congas, 3 backup singers and songs in English and French - none of which I had ever heard before! We had a good time once we all got warmed up! After our small group meetings, we had about another hour to go through our different outreach presentations. The presentations aimed at the adults are Sketchbooks and mime. Michelle working on her Sketchbook presentation. Both of these presentations are performed in a public place where crowds can easily gather. They are meant to allow people to view the presentation, stop, and think about it. The mimes are pretty straightforward - an act and an explanation. The Sketchbook presentation links art with a story that presents the gospel in a simple, yet powerful way. At the end of the presentation, the people in the crowd are then offered invitations to the international services that we are holding each night this week (except tonight and Wednesday). Man, whoever set up that puppet theater did a great job! 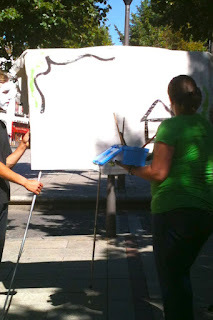 1) Setting up the puppet theater. 2) Being a friendly bouncer during the Kid's Clubs. The second responsibility is really just an extension of the first, since any good tech guy will tell you to leave his stuff alone, and during the Kid's Club outreach puppet show, I just make sure that none of the kids knock the stage over (this pretty much involves me trying to look intimidating). In reality, we get to play games with the kids, and I got a 30- second crash-course in making balloon animals. (I can make a killer poodle or giraffe, depending on how you see it, and something that looks a bit like a sword.) The Kid's Club is set up in the same place each day of the outreach so that the local churches can build relationships with the children there. Michelle, doing her Sketchbook presentation. While I was fighting a crowd of kids, desperate for balloon puppies, "Monsieur, monsieur, je veux un chit!" Michelle and Emily were in a different part of the city doing their presentations. Michelle was part of a Sketchbook team, and Emily handed out invitations to passersby. All in all, it was a very good day. The adult-focused outreach teams were able to have several good conversations with those who watched the presentations, and we had over 30 kids come to the Kid's Club on the first day. After the outreach, we went back to the church for dinner, and to practice for our presentations during the international services that begin tomorrow night. When that was over, we packed up and headed to our host home. The house in Riom where we are staying for the week. We studied Acts 2 today for our morning devotionals. 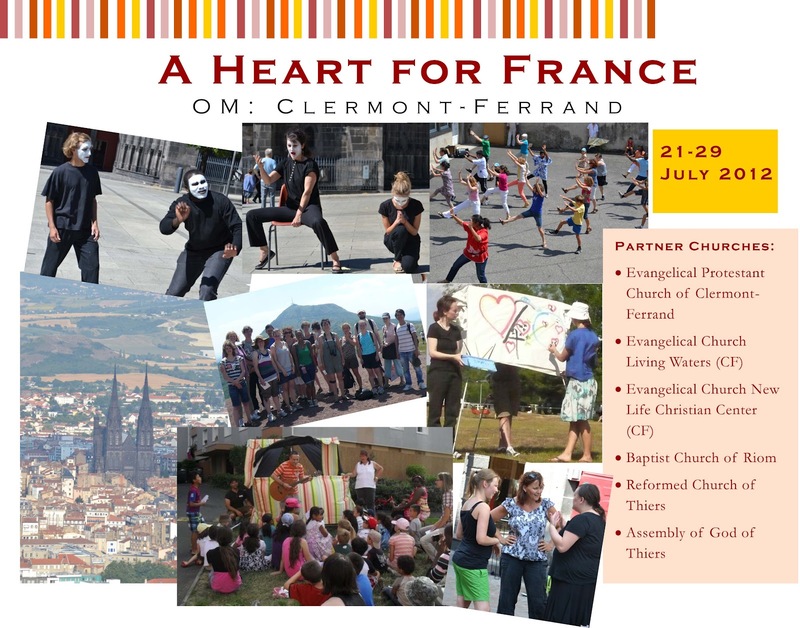 Please pray that the people of Clermont-Ferrand will respond to the gospel the same way the crowd responded after the Apostle Peter shared the gospel, saying, "What should we do?"